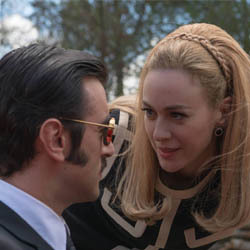 Trailer for the much anticipated spin-off of the popular Spanish series “Velvet” has been released, the first season of the spin-off which is called “Velvet Colección” will air on Movistar in September. There will be many changes with a jump of five years in the story line, the story this time will take place in Barcelona. This new series promises to maintain the essence of the original ‘Velvet‘ that has made everyone fallen in love with it, the love stories and passion for fashion will certainly continue, but with a whole new packaging and many new characters. This series I dearly loved,it kept my attention 100%,I do hope you will give me somemore of this exciting program. Any further decisions made on English subtitles for velvet coleccion spinoff? pleaase i need it i love this serie is my everything!!! Loved Velvet! Excited about the spinoff. Will it have English subtitles? Available in North America? How do I view the series in the U. S.? Will English subtitles be available? Thanks sharing this trailer! Can’t wait to watch Velvet collection! Will you guys be putting velvet collection episodes with English subs once the episodes air? No guarantees right now, we will see. Any further decisions made on English subtitles for velvet coleccion spinoff? Pleeaaasseee I love this series so much!! !